There’s a lot of good things in writer director Callum Crawford‘s debut film, Degenerates. The cast is solid, the premise is fun and there are some legitimate laugh out loud scenes. But, the film suffers from a sense of urgency, especially given the premise. The story centers on Casey (Crawford), a semi-successful screenwriter who’s been having trouble selling his screenplay ideas. After his agent (Jamie Foreman) tells him that true life stories are hot sellers, he comes up with an idea to create his own tale. 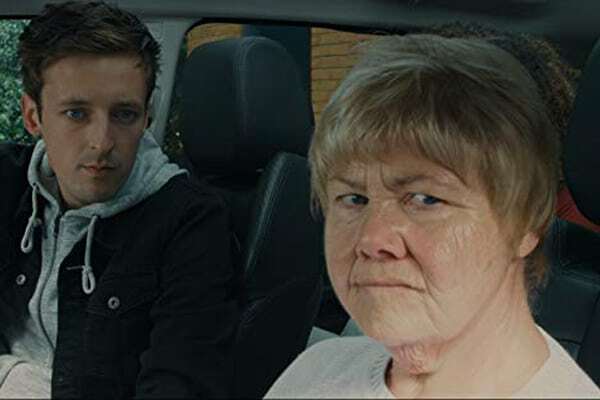 He recruits a band of misfits – Maureen (Annette Badland), an aging pharmacist/drug dealer, Naomi (Lauren Douglin), a thief, and innocent (looking) teenager Peter (James Sanbrook) – to be his sidekicks. Because, as you know, all good stories have their own set of zany characters. They then take it upon themselves to find a missing school girl. But, like in life and fake made-up stories, situations never go as planned. Crawford, who is directing himself here, has an understated performance as the straight man and it works really well. Badland delivers the most laughs in the film. Her character is a legitimate baller and quite possibly a bit insane. And the crazier and more desperate she gets, the funnier her performance is. Doughlin and Sanbrook’s characters aren’t as developed as the older Maureen but still put in fine performances. One big thing is that the story forces the gang in kind of a race against the clock. Yet, everything seems to be going along at a leisurely pace, which gets a bit frustrating at times. For his first film, Crawford shows a flair for comedy and directing actors. It’s definitely a promising debut.